Not that you would ... right? 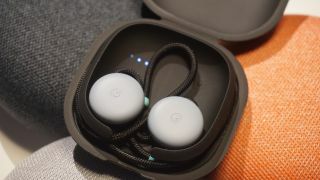 One of our chief complaints in our hands-on Google Pixel Buds review was that the "wireless" earbuds aren't actually wireless. That's because the headphones, which tout the ability to translate different languages in real-time, are connected by a cord, thus disqualifying them from being true wireless 'buds, as is the case with the Apple AirPods or Samsung Gear IconX. And, even if you're tempted to cut the cord between the Pixel Buds (... just because? ), you shouldn't. As spotted by Android Police, Google's support page for the headphones warns against it. "The cord between the two earbuds conducts power and audio signals so do not cut it," the page reads. "The warranty will be voided if the cord is cut." Turns out the cord isn't just to prevent you from misplacing your Pixel Buds. It actually serves a purpose, and the headphones will likely be ruined if you snip the cable. Google's Pixel Buds go on sale in the US in November for $159. The earbuds will come to the UK and Australia shortly after, costing £159 and AU$249, respectively. You'll have your choice of three colors, each designed to match the Google Pixel 2 and Google Pixel 2 XL. The cord, far as we can tell, isn't customizable.